One of my favorite things about where I live is that there is all kinds of wildlife I can see right outside my window. I don't need to go anywhere to experience nature. If you want to boost the wildlife population in your yard, here are some inexpensive ideas that provide a safe habitat for local creatures. Build a mason bee house to attract these pollinating bees to live and work in your yard. You can also buy a stylish pre-made mason bee house for about $20. Install a birdhouse to give birds a place to live in your yard even if you don’t have a lot of natural nesting sites. 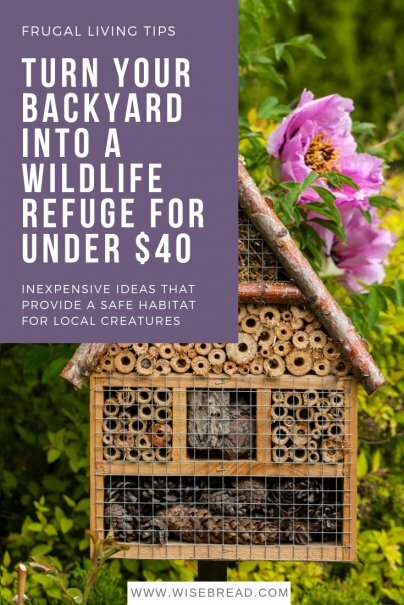 You can design and build your own birdhouse from a variety of scavenged materials including coffee cans and cowboy boots or order a wooden birdhouse kit for around $12. Birds will come from all around if you put out a bird feeder and keep it stocked with fresh birdseed. You can choose a simple tube-style feeder for as cheap as $5–$10, or get a rectangular feeder for a few dollars more. Sprinkle a bit of feed on the ground to help birds find it. You can attract hummingbirds to your yard by putting out a nectar feeder, which will cost around $10. Hummingbirds are attracted to red, so choose a feeder that is red or one that has a clear glass that can be filled with red nectar. Change the nectar every few days to keep it fresh. You can buy this nectar in bulk (about 64 oz) for about $10. I mix my own nectar in small batches using a powdered formula. You can also keep unused portions of nectar fresh in your refrigerator until you need to add it to your feeder. Orioles are distinctive orange and black birds that like to eat sweet things. Attract them with a nectar or jelly feeder for about $10 featuring the color orange. Put out a birdbath, and birds will come to your yard to take a bath and get a drink. A birdbath can run anywhere from $10–$40, depending on the size you get. Keep mosquitoes from using your birdbath as a habitat by changing the water at least once a week, or use a bacterial insecticide that is not harmful to birds, fish, or other wildlife. Woodpeckers and other insect-eating birds will visit a suet feeder (for only $10!) to get some quick energy. You can use a small metal cage or a netted bag to hold suet so that birds can access it. Place a suet cake or suet ball in your feeder and watch the fun. I enjoy watching bats fly around at dusk eating mosquitoes and other insects. Attract bats to your yard by putting up bat houses. You can build your own bat house from plans or buy a preassembled bat house for about $30. Some people consider squirrels to be pests that raid their bird feeders, while others think squirrels are entertaining and enjoy having them around. If squirrels amuse you, put out a squirrel feeder (for about $25) to serve up ears of corn and bring squirrels in close for easy viewing. There are a number of plants that can attract butterflies to your yard. A butterfly bush includes low-cost seeds (a pack of 500 seeds runs around $5) and has abundant fragrant blooms that draw butterflies in from all around to feed on nectar. Milkweed attracts Monarch butterflies, since they are a favorite plant for Monarch caterpillars to eat. You can leave an area of your yard unmown to provide shelter for wildlife. For a small area, you can use a hoe to take out any undesired weeds, resulting in an area of tall grasses that provides shelter and a natural source of nesting materials for the ecosystem in your yard, and that won't cost a thing.